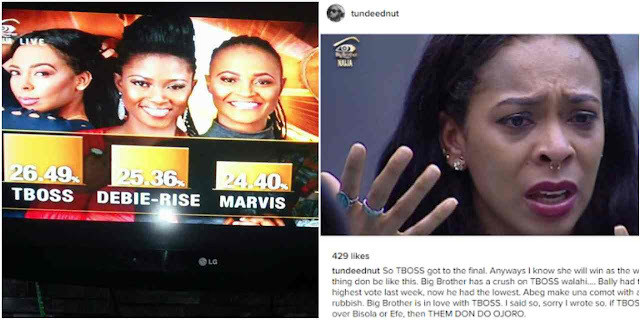 So many controversies has trailed Bally's exit from the Big Brother Naija house, as a Nigerian producer, Tunde Ednut, who has been at loggerheads with Nigerian crossdresser, Bobrisky, is insinuating that the votes were rigged to favour TBoss who got the biggest votes. According to Tunde who showed his dissatisfaction with the show, right from the day Kemen got evicted, the votes were rigged because Biggie has a crush on TBoss, who most Nigerian celebrities are campaigning for. He went further to disclose that Bally shouldn't be the one to go, because he got the biggest votes last week, suggesting that votes were tampered with. 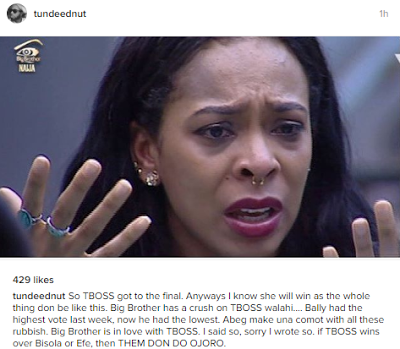 "So TBOSS got to the final. Anyways I know she will win as the whole thing don be like this. Big Brother has a crush on TBOSS walahi.... Bally had the highest vote last week, now he had the lowest. Abeg make una comot with all these rubbish. Big Brother is in love with TBOSS. I said so, sorry I wrote so. if TBOSS wins over Bisola or Efe, then THEM DON DO OJORO." he wrote.